Your Intranet Search is Over! 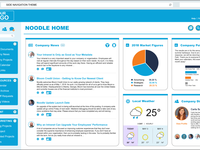 Noodle is the All-In-One, Easy-To-Use Intranet for the Enterprise. Noodle provides a wide array of functionality. Local or Cloud Deployment, Role Based Permissions, 14 Integrated Applications, Forms & Workflows all with with Single-Sign-On user management. Also, you work with a support team that has been helping companies build intranets for over a decade, Its time to use your Noodle! Visit the website for a FREE Demo. Noodle helped to bring back life to an old outdated intranet site. Pros: Noodle has a cloud based system that will allow you to access your website outside of your company's network. They have also integrated a Single Sign On (SSO) option for the cloud based users as wel. This makes it easier to login your intranet site if your company already is using a SSO software especially Windows Active Directory. The interface allows you to easily build pages and has a drag and drop feature that most people are familiar with. It also has features that will allow you to easily setup a photo gallery, create a poll, make and merge calendars, and create interactive forms. 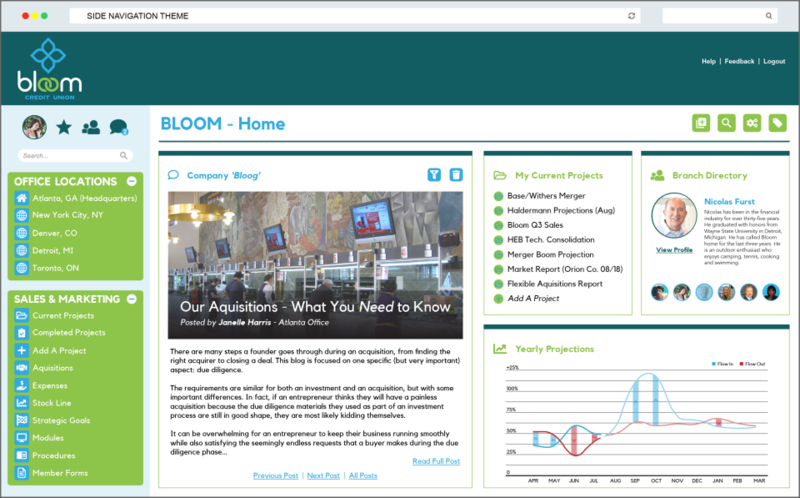 Using Noodle allowed our company to retain existing functionality from our old intranet site while incorporating new ones. Cons: It would be nice if Noodle would allow you to connect to an external database or use an API widget in order to use existing custom built applications/import data. There are some features that are incorporated in the site (while useful) that are not intuitive to the end users that cannot be disabled. Pros: Easy to use, low cost, high ROI, outstanding support, flexible, robust, secure and safe. Cons: Less flexible in design to some of the high end product. Overall: It is a pleasure recommend Noodle from Vialect. The product is incredibly easy to learn to use from a design perspective and practically intuitive for the standard user. With help from the Noodle help center we have managed to build and extensive, interactive and informative intranet that is relied upon within our organisation of 500 staff. Maintenance is easy as long as you have a good map in place for your content. We have delegated responsibility for content to section contributors thereby avoiding the need for extra resource to maintain the intranet. Further, content is written and maintained by the subject matter experts. At a fraction of the price of many other products but yet feature rich and with the best support I have ever experienced from a vendor, we highly recommend Noodle from Vialect. Recommendations to other buyers: At this low cost, go for it. No great scare about the cost of the investment. Comments: My client was seeking an Intranet portal for a network of over 65 different offices across North America and Noodle was by far the most economical and most flexible platform on the market. One of the greatest strengths of Noodle is the permission levels available per user/group. 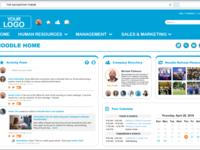 Intranet applications in general are still relatively behind in terms of their usability and design, but Noodle does a great job of simplifying the Intranet but still includes many valuable tools and applications. In addition, the team at Noodle does an outstanding job of providing quick support and listening to opinions on future improvements. 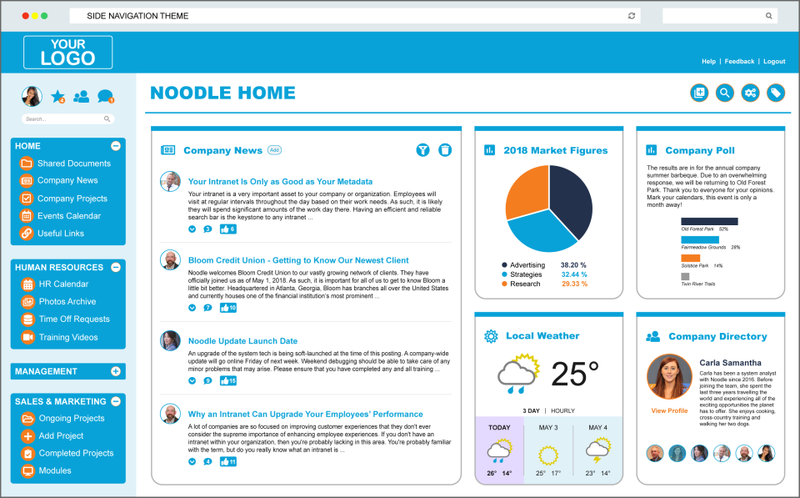 If you're looking for an easy-to-use, cost-effective platform for your intranet, Noodle is one of the most economical and flexible platforms out there. When Noodle works out of the box on mobile, i'll gladly give it a 5 star rating! Pros: Secure and centralized our intraoffice communication. Because we use Noodle as the hub for policies, human resources, and training documents and videos, it took a lot of time and effort to get this running. The time invested wasn't due to the Noodle programming, but due to the large amount of information we needed to publish. Logging in and updating is simple. 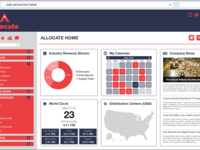 The layout is user friendly and customizable. Cons: Internal messaging is only delivered if the employee is looking at the Noodle program. There is no desktop function that sends the message or an indicator to look at messages received unless you are in Noodle. Comments: Our organization has now evaluated many document management, corporate social networking, internal portal and content management systems. Keeping an eye out for ease of use and rich but simple feature set that met our requirements. Noodle was the perfect product for this and also at a price that easily fit into our budget. Additionally, their customer support, ability to adapt to our requirements and energetic attitude was very refreshing. We sent a short list of similar products to a test group of 15 users. The users unanimously voted Noodle as their preferred choice as a document management and internal social networking site. Cons: There is no out of the box MS Office Integration. However, after speaking with sales and their technical teams we were able to determine a solution that would be included in a future release for integration with MS Office 2013. Does not appear to support NTLM so users are required to login, this makes it difficult to make company announcements that would appear on the users web browsers home page (forcing the user to login to see them). Pros: I managed to create a useful site for our staff in less than 48 hours. It went up so fast and is incredibly easy to populate with content. Cons: Sometimes certain things have a mind of their own... the home screen skews percentages of columns depending on what section I put in it... but I can't seem to figure out why... I also don't like that if I lock down editing for an area, users can't 'like' anything there... makes the like button sort of useless. Overall: I think our site helps highlight staff involvement. It's also an extra level of security & visibility on documents such as policies and procedures that need to be kept off of our public site but still easy to access. Pros: Easy to use and customize. It is a source of invaluable information for our team. Cons: Some formatting lost when copy/pasting from other applications. Overall: Love the software and especially happy with the Customer Support team who helped to customize a solution for our team. Comments: Our organization has now evaluated many document management, corporate social networking, internal portal and content management systems. Keeping an eye out for ease of use and rich but simple feature set that met our requirements. Noodle was the perfect product for this at a price that easily fit into our budget. Additionally, their customer support, ability to adapt to our requirements and energetic attitude was very refreshing. We sent a short list of similar products to a test group of 15 users. The users unanimously voted Noodle as their preferred choice as a document management and internal social networking site. - There is no out of the box MS Office Integration. However, after speaking with sales and their technical teams we were able to determine a solution that would be included in a future release for integration with MS Office 2013. - Does not appear to support NTLM so users are required to login, this makes it difficult to make company announcements that would appear on the users web browsers home page (forcing the user to login to see them). Pros: Customer and tech support. The features of the platform. Cons: Can be a bit tricky getting some of the functionality working properly, but that is due to user skill level. Any issues, we contact the support team and they help us get it sorted. Overall: We used vialect/Noodle as our intranet platform for our UK physiotherapy clinic franchise - Sports Physio UK. The customer support with setting up the platform was excellent, and their tech team are always prompt to rectify any glitches or issues we come across. This platform has given our Team a place to collaborate (formally and informally), share information, disseminate news/updates within the team, and share documents/files. The great thing is, it is future proof for us and can grow with us and adapt to our evolving needs. Pros: The desktop version is user-friendly and easy to navigate. Cons: Doesn't have an app. The mobile versions isnt the most user-friendly. Overall: The customer support was so helpful during our set up process. Anytime I needed anything, he answered emails within minutes. He's able to answer questions and resolve any issues right-of-way. Pros: Noodle is very well made. Its easy to apply forums, interact with others inside the organization, and you're able to customize your own page just how you want. You also don't have to host it anywhere on the web and you can apply restrictions so that others can't log in unless they're in your network. Cons: The issues I found were similar to SharePoint and Wordpress in that you are almost limited with how you create your work, but nothing is impossible. Another issue I found was the pricing. If you have Office 365 license you could just use SharePoint. But Noddle is a good alternative if you're wanting to work around all that. Pros: It's easy for a person who doesn't have IT experience to setup and run. The layout is simple and most users have no issues finding things. The email notifications are handy too. Cons: It looks very generic and unprofessional. You have to delete your cookies for profile updates to take place. The chat box doesn't have emojis, spell check, or allow you to have the chat up while navigating Noodle. It's just ok, overall. 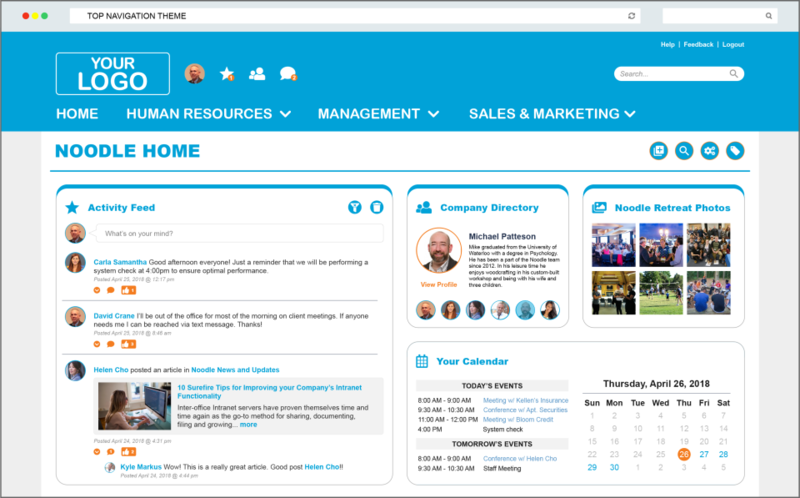 Overall: It's a more fun way for employees to interact than just via email. Pros: Noodle is easy to navigate. We use noodle for updates and to find information to help our customers. I never have any problems using Noodle to do this. Cons: Currently, I do not have any dislikes about Noodle. Overall: As a customer service representative, it is always helpful to have different information sources when assisting customers. Noodle is our main additional source. 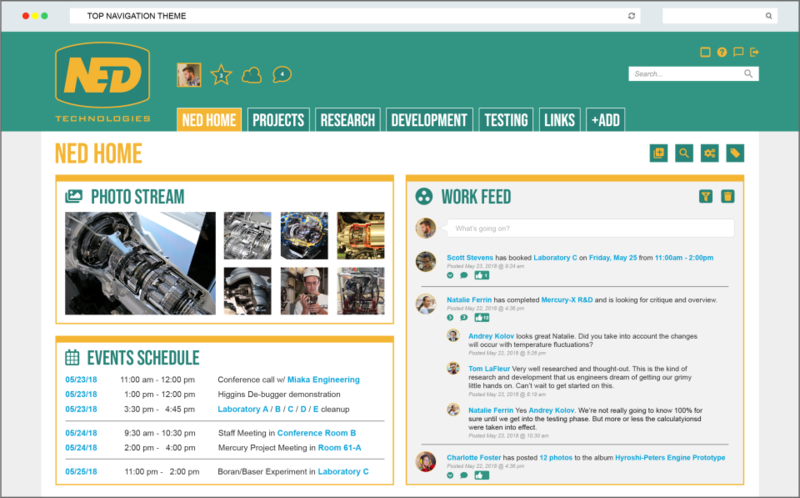 Pros: It looks nice on the surface and if you have the time to dedicate hours to polishing it administratively it could be a great intranet. Cons: It's very frustrating at times to administrate. The admin gui is not user friendly or intuitive at all. We have been unable to get users to interact with either working on it or using it. Comments: Very good app, customer service is very responsive. 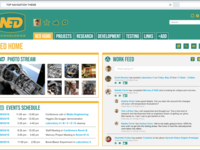 Noodle is a all-in-one intranet package for small and large companies alike. Our account manager/trainer walked us through every aspect of the demo process and go-live. When we have questions, we get quick responses and or he fixes our problems. So far this has been the most economical and best fit solution we have come across. Our company has really benefited from our Noodle site. Pros: Very easy to use. Has all of the basic needs for a intranet site. Quick to deploy. Great customer support and training. Cons: Does not integrate with outlook/exchange calendars very well. Messaging needs a little improvement, but I believe will come with time. 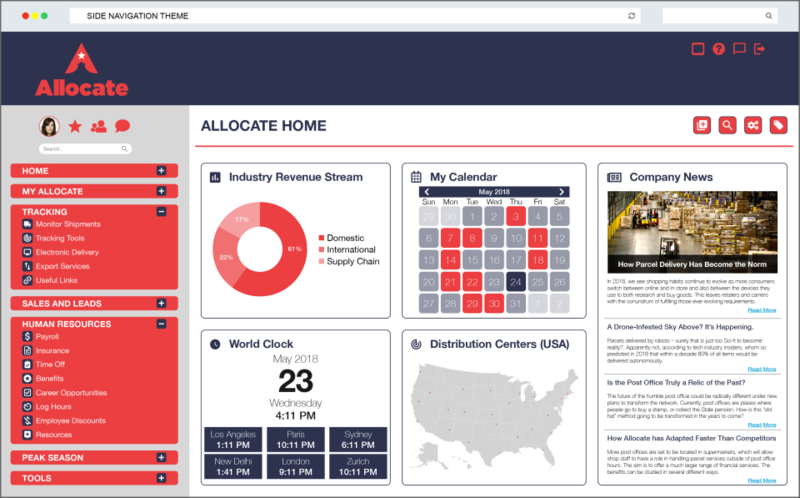 Pros: Having a centrally located intranet where all your internal operations important information is at the ready for your employees in a secure environment. Noodle gave us all the tools and applications we were looking for. Price & support is excellent! -The tools and applications are very easy to learn and use. Excellent! I highly recommend this for a smaller corporation on a tight budget. Comments: We are using the software for our five employees. 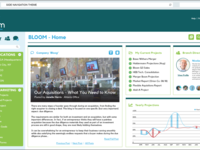 With this intranet software we are able to publish news and useful links in one central location. It easy to use but also easy manage for the admin. Pros: If you are not a tech guru, it is okay because the simplicity is nice and capable for those who struggle. Tech support was great as well. Cons: I would love for this to have Office available right from the get-go. The mobile version can be hit or miss. Overall: For smaller structure, this is good but I am not sure how it would work out on a big playing field. Pros: Its cheap, easy to use and no contract!! Its hard to find a program that does everything Noodle does in one place. Comments: Fun product idea and good functionality. Product is not too intense with a very helpful customer support team. Pros: Noodle is very user-friendly and the cost is very inexpensive for the value you receive. Customer support is great. Cons: The design isn't very high-end. The mobile aspect of this software needs improvement and messaging could use improvements as well. Good value for money with Noodle. Does what it is meant to do without any unnecessary functionality. Cons: As an intranet tool it does what it needs to do, only drawback is the outlook integration is not very good at this stage.